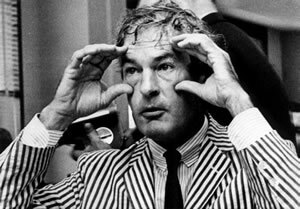 Posted in Consciousness, Creativity, Culture, Imagination, LSD, Psychedelics, Religion, Timothy Leary and tagged Consciousness, Creativity, Culture, Imagination, LSD, Psychedelics, Religion, Timothy Leary. BTW,chapter nine of “The Genesis Generation” (titled Caitlín’s Salon) takes place at one of those salons. It will give you a little better feeling for what went on there. What is “wrong sounding” about it? Not wrong as in “incorrect or flawed”.. it’s just my little attempt at humor after a couple too many bong hits one night. A line that is “wrong sounding” only if taken out of context… yes, in this instance it’s perfectly acceptable. But… if you print a bumper sticker that says “my kids turn me on” you’ll soon see how a line of sage wisdom from a tribal elder can be misunderstood in a comical way. I loved this talk Lorenzo! Great pick! These talks really help our community get to know Dr. Leary. Too many people dismiss and blame him as the sole cause for entheogens becoming scheduled. Here we can listen to his philosophy and practice first hand. Was his non-elitist approach the downfall of psychedelics legal status? His actions may have contributed. However he should be minimally given some credit for making our country more aware, innovative, caring and loving. Not to mention his putting what he believed in before his career. IMHO the path he choose is more effective at curing culture then putting these sacraments only in the hands of Dr’s and corporations (for profit or not). Repealing the prohibition of these sacraments for spiritual purposes would be more beneficial to society then the for therapeutic use only cause. I do appreciate the work of Dr.’s and organizations trying to legalize medical use. However I believe the right to use entheogens under freedom of religion needs to be perused equally if not more then the medical acceptance efforts. Can you elaborate on this. Was this held for the public? & maybe how I can get more info on these little gatherings. I would have loved to chat you again & other like psychonauts. Loved the podcast by the way! Thanks. Alas, that was a precise description. For eight years now our beloved Kathleen has hosted a salon (originally called “The Hofmann Foundation Potlucks”). But circumstances have forced her to leave her wonderful house in Venice Beach. … however, the spirit of her salons will live on forever!